Instituto de Odivelas, created 115 years ago, is the only public boarding school in Portugal for girls aged 9 to 17. IO provides a top class education and high standards to daughters and orphans of military personnel, and civilians, including girls from countries that use Portuguese as a language. IO's phased extinction meant that the girls are being shifted to the equivalent army school for boys, and that they have lost their curriculum, their space and all their symbols: uniform, hymn and flag. In the boy's school they are now handling guns since the age of 9. Their education became a boy's education. IO has always occupied the highest ranks among secondary education schools in Portugal. IO occupies a convent from the XIII century, in prim conditions, adapted with dormitories, classrooms, science and language laboratories, computers, gymnasium and swimming pool. Specific curriculum choices include cooking and learning to deal with young babies. Former IO students have distinguished themselves in their professions, which include arts, science, engineering, medicine, literature and politics. The government uses economic arguments to close the school, but those have been shown not to be correct. Among the military schools in operation, IO proved to be the cheapest and the most successful. As elections for Parliament are approaching next October the time is right to apply all the pressure we can master on the Prime Minister. 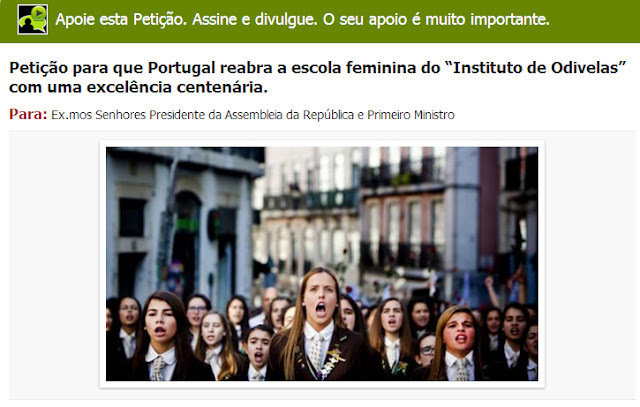 LET US SAVE INSTITUTO DE ODIVELAS. LET THERE BE EQUALITY OF OPPORTUNITIES FOR GIRLS AND BOYS IN EUROPE IN THE XXI CENTURY. LET THE GIRLS AND THEIR PARENTS RETAIN A CHOICE!